Daily Illuminator: Last Day To Order!!! December 19, 2017: Last Day To Order!!! Looking to order holiday gifts from Warehouse 23? You may want to place your order right now, because the clock is ticking! There's not much more time to play Santa and take advantage of special offers like the Munchkin Holiday Grab Box, Car Wars bundle, Munchkin bundle, and Mars Attacks bundle. 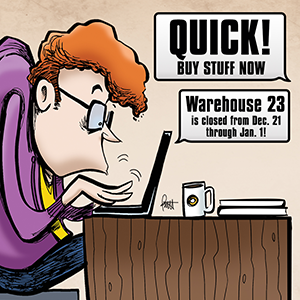 The longer you wait, the less likely your Warehouse 23 order is to reach you this week, so please hurry, while there's still time. And if you miss placing your order today, please check our online store finder for the game store closest to you. Your friendly local game store is ready to help with all of your holiday needs . . . and you won't even have to deal with the headaches or expenses of shipping.